Victoria’s work is celebratory often responding to the beauty on this earth and our connection to it. Over the past ten years she has built a collection of paintings of: seeds, gardens, flowers, water, pools and seas and most recently spring blossom. Victoria’s love for pattern, colour and light led her to develop painting techniques using, oil paints, gold leaf, lace and sometimes sequins. 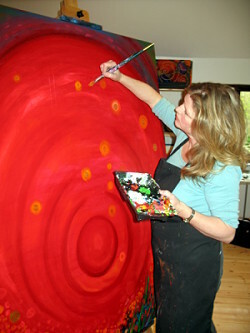 ‘Blossom’ her most recent project was supported by Arts Council England. Victoria celebrated the arrival of blossom, documenting its arrival from bud to petal fall taking up an an arts residency within the fruit orchards at the National Trust’s Hardwick Hall in Derbyshire and Chaddesden, Derby amidst glorious cherry blossom edged roads. The Blossom project aimed to reconnect people to the natural world encouraging them to respond creatively to its beauty. Victoria believes celebrating the beauty and wonders of nature through the arts is one of the first steps towards environmentalism, encouraging people to take time to look, see beauty and fall in love with the world around them. Her new ‘Blossom’ project follows closely after her highly successful 'Losing Lace' project, her painting style has its roots in the beautiful lace her family once manufactured, fascinated by the negative spaces in the lace and the complexities of its construction. The project celebrated lace, its intricacy, past economic prosperity and engagement of memories, but also the harsh reality of loss of industry, finance and ultimately skills. Although the project is now completed the lace paintings and work continues with exhibitions, lace talks, bobbin lace making and making plans for new lace projects. Alongside these paintings Victoria’s focus for her project work lies in exploring ways to effectively nurture creativity, encouraging people of all ages to engage in the arts. She believes creativity is in all of us, and is an invaluable means to express ourselves and respond to the world we live in. Being creative fosters emotional wellbeing and connects people to the world around them, valuing people, places, communities and highlighting issues we face. Currently Victoria is working on a project which will focus on soil and growing. She will be studying a crop from seed to harvest creating a new collection of paintings and providing opportunities for people to get involved.